I have friends who have been sketching on the train on their sketchbooks and there is also a growing interests among more friends now to sketch when they are taking public transport. 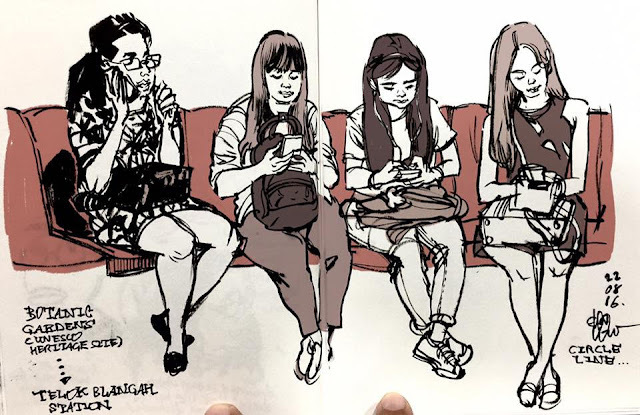 I have been sketching commuters for quite sometime since I started Urbansketching, and even more so whenever I have the opportunity to travel on public transport, mainly the MRT aka Mass Rapid Transit, the quick rail system in Singapore. In Hong Kong, they call it MTR, a much more efficient train system that runs across the congested city under and above ground. I love taking train as a mode of commuting, during the off-peak hours, because I would get a seat, and when I am able to sit, I would draw the commuters sitting across me or from another cabin. 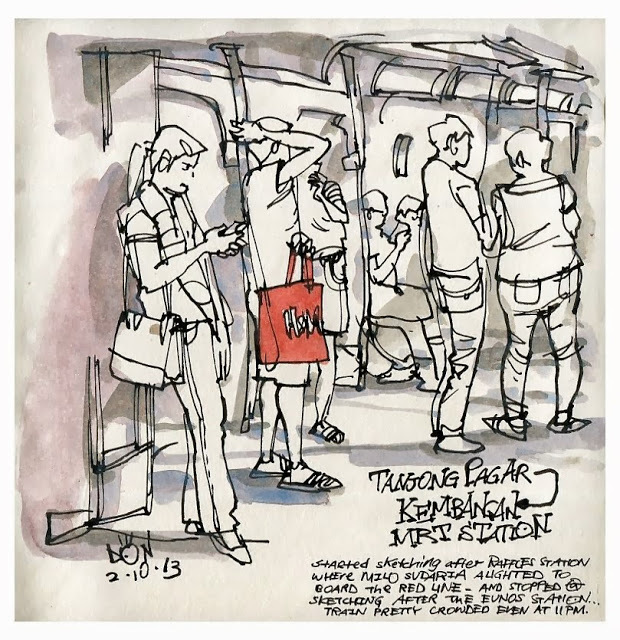 Drawing commuters when they least expect it is a fun and practical way of practicing portrait and figure drawing. 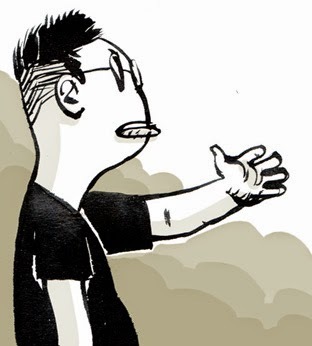 Firstly you have to draw fast, that will help improve gesture drawing and drawing by memory. Secondly commuters offer different and varied opportunities to draw many poses, and that improves observational skills and makes it more fun. When I draw on the train, I make sure I don't carry too many things. 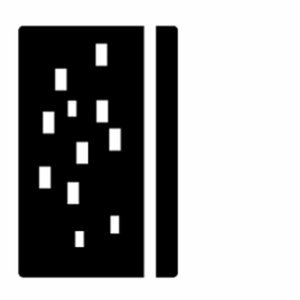 Usually I would only use a small stack of papers clipped on a wooded board (you may use cardboard) that provides a sturdy and firm surface and support to draw on. I love to use brush pen as it allows me to fill in blacks very quickly, the technique I used on hair most of the time. In the example above that I completed quite recently, by using a brush pen, I could paint in the shape of the head and hair in an instant without having to draw any outline. You could draw in the contour before filling in the blacks too, there is no hard and fast rule for this. You should actually find a suitable method that allows you to draw fast. The few drawings are later scanned, cleaned up and colours filled in in Photoshop. I wanted a more realistic look for my commuters so I paid a bit more attention to get the likeness in a short time, starting from the ear, to the back and top of the head and completing the contour of the head and face while filling in the features. Sound easy. It takes a lot of practice and I find drawing a lot blind contour drawings help with getting accuracy, proportion and speed. The following are some commute sketches I did in the recent past. You will also notice I added the stations' names as part of the sketch to help me remember where I started and finished the sketch. A sketch like this would probably take 20 mins to complete. 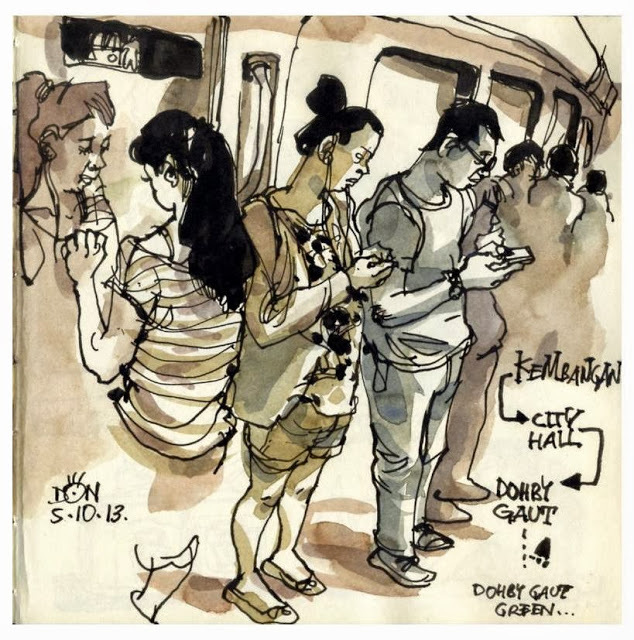 Commuters come and go, and selecting what to draw and what to omit is the trick to make an interesting composition that works for your format (size and shape of your sketchbook). There are times I would just draw a commuter and there are times I would finish off the entire scene. I used very different approaches all the time. Different tools give a slightly different perspective of the drawing. Besides brush pen, I use the Hero Fountain Pen a lot too. 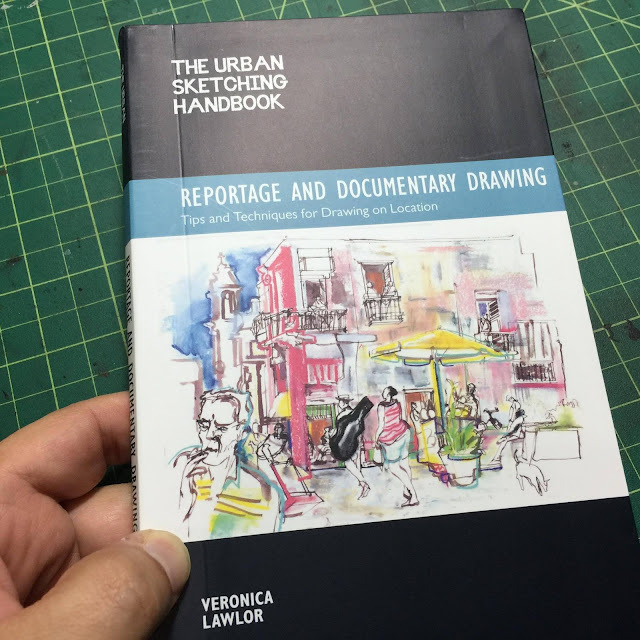 For this I would make sure there is ample and generous ink flow so that the process of drawing is not hampered by it. Any kind of skipped marks and ink stoppages always spoil the mood. Another one that was done with a brush pen and coloured in Photoshop.